What are we collecting this year? What are Fidget Lap Quilts? Small "blankets" with ribbons, beads, buttons, pockets and other "fidgetable" trinkets & treasures attached for patients to fiddle with and entertain themselves with. They are very similar to the ones people make for a baby but with more mature colors & themes. A Google image search of "Senior Fidget Quilts" brings up lots of examples to inspire you, just watch the sizing. How big should I make my fidget quilt? These blankets are not meant for warmth and are used year round so they need be no bigger than a table placemat. I don't sew. How can I help? You can donate trinkets & treasures for us to sew onto blankets. Items like big beads, key rings & keys, snaps, clean men's button up shirts, denim pants/shorts with intact back pockets, fabric ribbon (without wires). We will also host a few "work days" at the library with pre-made mats that we need volunteers to attach fidgets to, sewing/crochet skills helpful but not required. I wish I knew how to sew! Can you help me? We will host a few group "Sew-ins" to work on fidget quilts for new and experienced seamstresses to work together. These will also act as basic sewing classes during the collection drive to teach new quilters. Sew-ins are on September 22 and October 13 from 10-noon. Bring your sewing machine, some fabric, and trinkets & treasures to work with us to make fidget lap quilts. We will have some prepared mats ready for embellishing for those who can't sew. Please bring some baubles to attach at least. 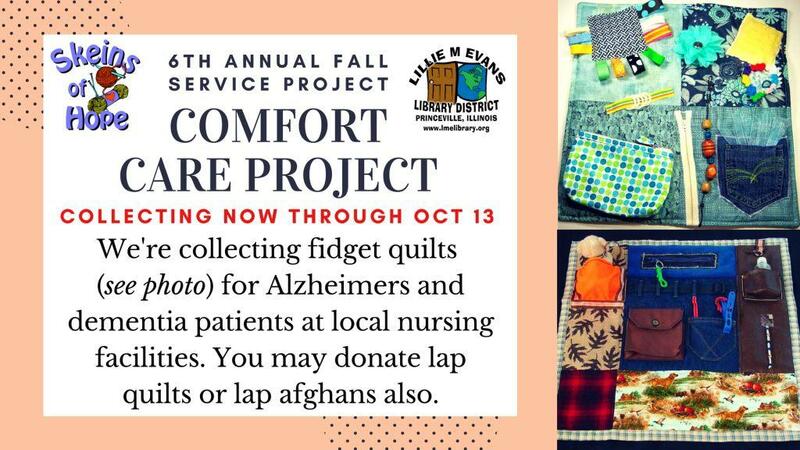 Where will the Fidget Lap Quilts be donated? We have partnered with Evergreen Legacy (memory care unit) & Heritage Healthcare (nursing home) in Chillicothe who is excited to receive our donations for their patients. Our goal is to donate 30 Fidget Quilts. How big should I make my Lap Quilt/Blanket? Lap quilts, blankets, & lapghans are generally 3'x4' (36 in x 48 in). These blankets will mostly be used in a chair or wheelchair to keep their legs warm. You may quilt/sew, knit or crochet these items. Where will the Lap Quilts be donated? We have partnered with Heritage Healthcare (nursing home) in Chillicothe who is excited to receive our donations for their patients. We have a big goal of 70 lap quilts and shaws! Where will the Shawls be donated? All attached items must be machine washable and securely affixed. No loose items, please. Do not include items that can be removed from a pouch or pocket and dropped on the floor. Simply sew a "leash" to the item, then attach the other end to the quilt, so it can still be taken in and out of a pocket but retrieved by pulling on the "leash" if it falls. Items may be themed for women, men, or unisex.